The yurts are located in the middle of a meadow with a view on an hilly scenery of woodlands and forests. Here, everything is mild and serene. By their shapes, their coloured furniture, painted in the Mongolian tradition and their felted environment, they will bring you a place to rest and to breathe. Vers les Bois, where we live, is one of several Donzy le National hamlets. It is admittedly a small village, but with loads of vitality and dynamisn. A place well-known for its cinema festivals "Ciné Pause" which celebrated its 20 year birthday in 2010. 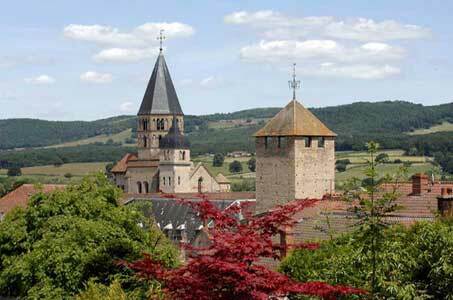 Cluny, situated at 7 km, offers all services but equally numerous activities, shows and festivals all year round that can be checked at the tourist office (concerts, theaters, exhibitions, cinema, swimming pool, horse riding, acces to the green lane (voie verte)). On the wine trail, you'll be able to taste white and red wines (Rully, Mercurey, Givry, Montagny en Côte Chalonnaise, Pouilly-Fuissé, Pouilly-Loché, Saint-Véran, Viré-Clessé…en Mâconnais, Saint-Amour, Juliénas en Beaujolais). One of Saint-Jacques-de-compostelle grand hiking trail, of which the trail markings are symbolized by a yellow shell, starts at Cluny to reach the Puy-en-Velay. 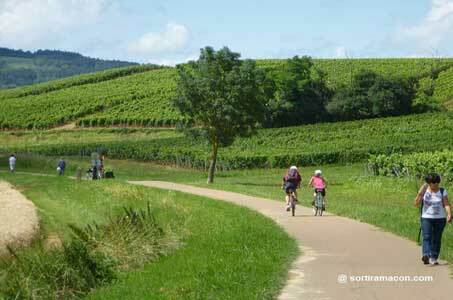 The voie verte (green lane), completely asphalted and practicable by foot, cycling or rollers, enable you to discover the Lamartinien Val by joining Cluny to the old Charnay les Mâcon station (21 km trail, possible return by mini bus with bicycle racks).